The UK has begun the first major revision of animal experimentation rules in over 25 years as the government brings the new EU Directive on animal testing (2010/63/EU) into UK law. This is an opportunity for the government to seriously commit to the implementation of sophisticated replacements for animal experiments; advancing science whilst ending animal suffering. The NAVS is urging the UK Government to adopt progressive approach for animal testing as Government prepares to overhaul lab rules. Through the ‘Cutting Edge, Not Knife Edge’ campaign the NAVS has distributed briefings, carried out photo calls and toured the country with our eye-catching billboard and received support from cross-party MPs. 2 December 2011: NAVS has met with Home Office minister Lynne Featherstone, held several consultation meetings with officials, and participated in a Home Office public consultation. NAVS is campaigning hard to maintain higher UK standards, but also for stricter measures in key areas. 8 December 2011: As the UK Government considers how it will bring the new EU Directive, 2010/63/EU, into UK law, MPs and animal protection and non-animal research groups have expressed concern about the lowering of UK science and animal welfare standards. Thank you for speaking out for animals in laboratories! The Home Office Consultation on the biggest overhaul to animal testing laws in this country in 25 years closed on the 5th September 2011. Thank you to all our supporters who took part either by answering the consultation or raising awareness. The NAVS was encouraged by the Home Office’s announcement, declaring the Government’s commitment to ending the testing of household products on animals. The NAVS is pressing the Coalition Government to use the new EU Directive on animal experiments, to make ten steps to advance scientific research, but without animal suffering. 13 July 2011: In a show of unity, politicians and peers gathered at Parliament, to request that the Home Office gears the legislation to replace animal use, while adopting the strictest animal protection legislation as the new EU Directive becomes law. They were accompanied by a giant inflatable beagle to help bring further publicity to this important animal welfare issue. 13 July 2011: When the Home 13 July 2011: When the Home Office published the annual ‘Statistics of Scientific Procedures on Living Animals’ for 2010, it highlighted how many animals in the UK will be affected by the implementation of new laws governing their use. 16 June 2011: The Planning 16 June 2011: The Planning Committee of East Riding Council voted to refuse planning permission for a new building for breeding beagle dogs to be used in laboratory experiments. NAVS objected to the proposal highlighting that the application was against the thrust of the new European rules on animal testing, Directive 2010/63/EU. 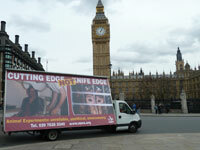 As the government began considering the biggest overhaul of regulations on animal experiments for 25 years, NAVS hit the streets with an eye-catching Cutting Edge Not Knife Edge billboard van that toured the UK, stopping at nine cities, with MPs and supporters greeting the van and leafleting in each city. 19 April 2011: The Home Office has told us that they plan to have draft legislation prepared by the autumn with a view to this being implemented by late 2012. This will be the biggest overhaul of animal experimentation regulations for nearly 25 years, as the Home Office transposes European Directive (2010/63/EU). 15 March 2011: The government is going to review the Animals (Scientific Procedures) Act 1986, to bring it into line with a new EU Directive on animal experiments (Directive 2010/63/EU), passed last year. However, we have been informed by the Home Office that they are considering changing the legislation WITHOUT A PUBLIC DEBATE! 9 September 2010: Several promising measures from the European Commission and MEPs were steadily diluted during the negotiations for the revision of Directive 86/609, as a result of heavy lobbying from industry and animal suppliers. The UK Government are urged to commit to replacing animal experiments during implementation. January 2009: A briefing from ADI was distributed to MEPs in Brussels, available in English, French, German, Italian, Spanish, and Polish. It urged the use of the new directive to replace Directive 86/609 on animal experiments to protect animals and advance European Science. In September 2007 433 MEPs signed Written Declaration 40/2007 calling for urgent action to end the use of Great Apes and wild-caught monkeys in experiments, and for a timetable to be set to end all experiments on non-human primates in Europe.